The ‘Nanhai Trading Post’ represents a typical structure found in the Far East or South East Asia, this combination of store and bar could perhaps be perched on the edge of a body of water. Consequently, there are enough parts to create a two storey structure on stilts, with a suitable landing stage around it. The basic kit consists of several sheets of laser cut MDF and card. The instructions included identify each of the numbered parts, and then move onto the assembly instructions. The pieces are sturdy and need to be removed carefully from the sprue with a modeling knife. Certain sections require clamping whilst drying, with six ‘clamps’ being provided in the box. As is the trademark 4Ground style, the sheets of MDF and card have been ‘coloured’ in a suitable style. This allows the kit to be assembled and placed straight onto the tabletop for gaming use. The landing stage may be omitted, the central building then becoming a part of a village or small town, perhaps in the centre of a clearing. This is a useful kit for Pulp, World War Two and Colonial gaming, and could also see use for the Indo-China War or even Vietnam. Going 4Ground need YOUR help – this is the first and, currently, only building in this range, but the company want to add many more. 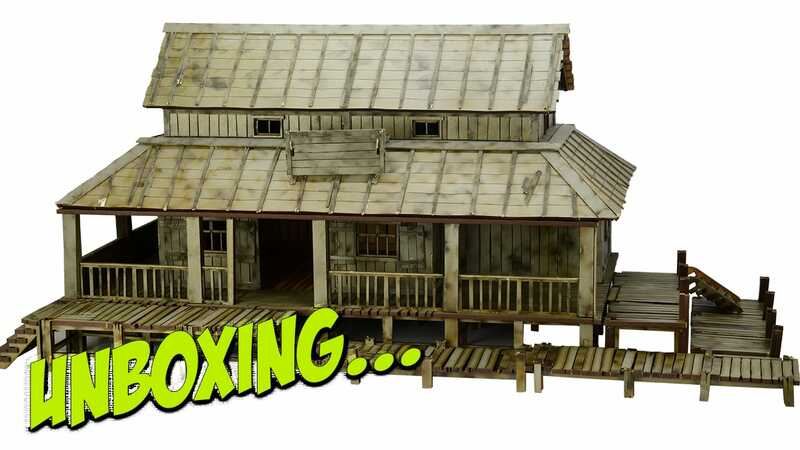 They are offering one of the Trading Post kits as a prize incentive for the best suggestion, so if you like the idea of owning your own kit AND seeing your suggestion come to life, contact us today! Store house. This building works for africa too. African native huts and of course South east asia native huts. french colonial buildings and out houses. Houses, shops, temples, stores. Basically whatever you need to make a village and an objective hence the suggestion of a store – the Viet Minh attacking a food store for example. I think there are some bits in their fantasy range.